Press play on 10 inspiring SEGD Talks. 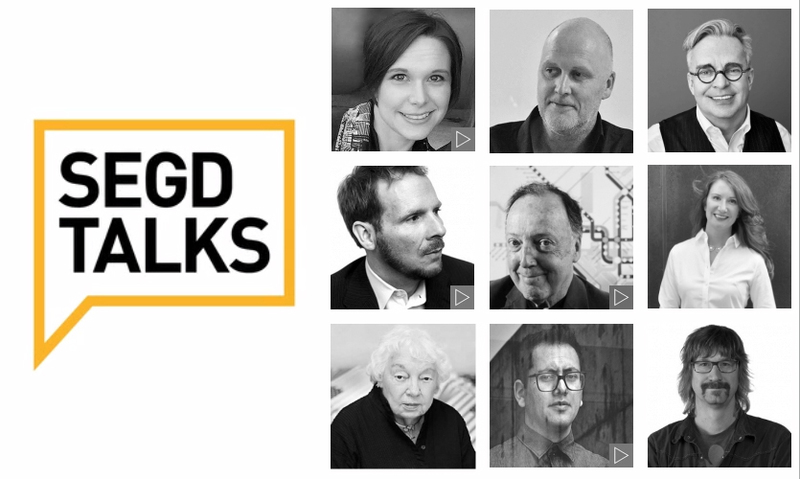 SEGD.org has an ever-growing library of videos called SEGD Talksthat feature innovative, inspiring speakers and empowering talks from all of SEGD's physical events—many are available for free to everyone. Lance Wyman, FSEGD,renowned Graphic Designer and SEGD Fellow, takes us on a journey through his international career and design process as noted in The Visual Diaries, starting with the 1968 Olympics in Mexico City. Jared Ficklinshows us graphically and dramatically how technology is creating new experiences. He'll define terms that are becoming part of the design vocabulary today: singularity, sentient machines, cognitive dependence, decision route support and semantic web. Hannah Andersongives a creative view on how to deal with stress, burnout and professional failure, what it means and how to grow from it. 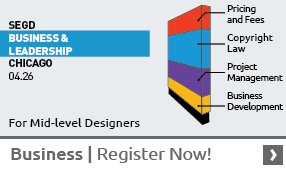 David ZachFuturist, describes what he sees ahead for experiential graphic design—it's a bit of a wild ride, but join him for a look at an evolving design practice model and our future as a global community of thinkers, doers and makers. Abbott Milleropens this talk by proclaiming "an exhibition is a room with a plot." He provides an interesting look at how exhibition design is uniquely tied to place using examples from his career. Jane Davis Doggett,design pioneer, gives us a look into her fascinating career in two videos: one from the 2017 Wayfinding event and one about her work called "Jane Davis Doggett: Graphic Artist, WAYFINDING IN THE JET AGE"
Mike Rawlinsonleads us through the first Legible Cities project and explores how technology, planning integration and user-focused design will provide cities with the connectivity and relevancy to become truly “smart cities" in a 2015 talk. He continues the discussion about cities and technology in his 2016 talk "The Digital City: Creating New Ecosystems." Refik Anadol,media artist and UCLA lecturer, gives us an entertaining view into making site-specific parametric data sculptures and creating immersive visual experiences to pair with live music performances. Katie Osborntakes us through wayfinding strategies formed by user research and community engagement for two outdoor spaces connected through a public infrastructure project in New York that was 20 years in the making. Brian Collinsgives us some personal background, poses questions like "do designers make the future, or are they in competition with it?" and talks about the journey of understanding your users and making brand experiences engaging, memorable and effective.